Brookemere, B.C. 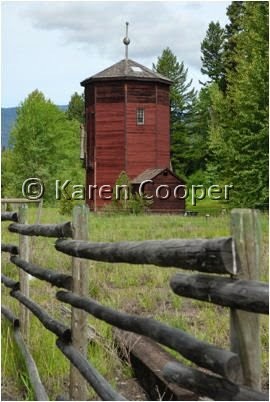 was once the stopping place for steam trains to re water along the Kettle Valley Railway. This tower is actually a water tower that the trains would stop under. The ball on the roof shows the water level in the tower. Clever stuff. The Kettle Valley Railway was built in 1915 for servicing the mining industry in Southern British Columbia. Silver and copper were two of the commodities that was being mined, and there is still a large open pit copper mine not far from here. Massive place, the sheer size of it is indescribable. This is such a tranquil country spot, and I can only imagine what it must have been like in the days of the steam trains. Some of the trestles still exist from those days, and are being actively preserved from some pretty dedicated folks. I don't know much about trains and mining. The more I wander this place called Mother Earth, the more I see how everything we do is interconnected and touches her in some way. She reclaims her own eventually, but we try and hold on. In the end, I think we can enjoy this tranquil country scenes with vestiges of by gone days, and wonder how we ever lived without the internet. You're welcome! your blog is great and very informative blog to travel Please visit my blog and tell me what you think! http://thailandtravel-hotels.blogspot.com Thanks!